As offshore wind turbines are built, infrastructure is needed to transmit the energy created by the turbines to where is will be used. The transmitting requires large sub-sea cables to be installed, possibly stretching miles from the farm to the substation where the energy is converted. The two major environmental concerns associated with transmission lines are coastal habitat alteration and electromagnetic field production. Transmission lines reaching from offshore turbines to substations on shore inevitably pass through coastal habitats. Of main concern off the North Carolina coast are wetlands which serve many vital ecological purposes. Some of the most attractive areas for wind energy projects off the coast could be at risk of damaging wetlands based on where the transmission lines are installed. Map of Submerged Vegetation and Wetlands. 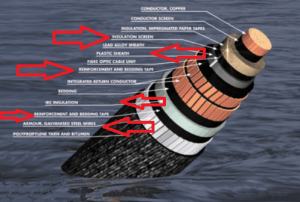 The other concern of sub-sea transmission lines is the electromagnetic fields created by the lines. Lines emit magnetic fields and an induced electrical field. With special casings including steel, lead and paper, the electrical fields can be contained. However; the magnetic field still penetrates the casing and can cause problems for magnetically sensitive organisms. Several types of fish use geomagnetic fields to navigate (Ohman), and it is supposed sea turtles may as well (Sale). Generating artificial fields could disrupt their migration patterns and life cycles.